Housed in a building dating back to 1888, the Mansion on Forsyth Park, Autograph Collection offering luxury accommodations and exceptional service amid legendary surroundings. 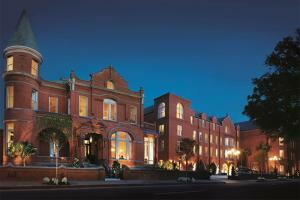 Rising above its namesake park in the historic heart of Savannah, the hotel features a beautifully restored Victorian-Romanesque exterior and boutique accoutrements. Lavishly appointed rooms and suites are accented with original artwork and marble bathrooms. Take a stroll through the hotel gallery or indulge in a soothing treatment at the luxury spa. Learn, laugh and have a wonderful time at 700 Kitchen Cooking School, where expert chefs provide captivating culinary instruction.